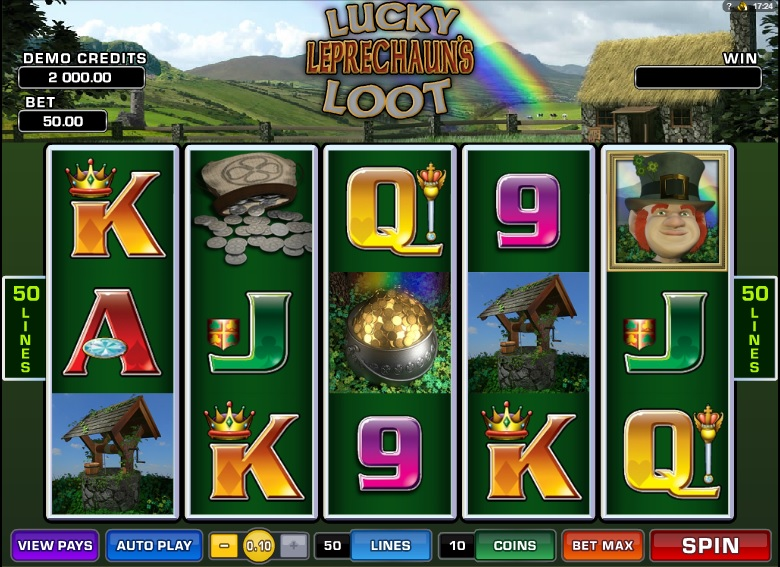 Lucky Leprechaun is a nice slot overall. It may look unimpressive, but the two features it has (the free spins and the bonus game) will make you come back for more. Surely, this time the sneaky leprechaun will share the pot with you, and you’ll start smiling just as wide. Popular culture has turned rather mean and grumpy leprechaun-fairies from Irish mythology into cheerful and presentable (sometimes even fashionable) symbols of luck and wealth. Few mythical creatures fit into the reels on slot games better that these modern leprechauns. Lucky Leprechaun slot from Microgaming is one of the many games exploiting the popular character. The game looks rather simplistic, with a green theme (no surprises here), short animations, and traditional Irish stuff as symbols. When it comes to enhancing your winnings, there are two scatters (the Lucky Clover and the Pot of Gold), and a wild (game logo). The Lucky Clover scatter appears on the fifth reel only, and activates five free spins with x2 multiplier. While in free spins, the Leprechaun turns wild. No, he doesn’t start running around biting your fingers off. He just gives you a cheesy used-car-salesman wink and substitutes the symbols (in addition to the standard wild). That’s not all the action going on in the free spins. You’ll also occasionally get a green clover or a golden clover attached to “cheap” card symbols. The first one gives you an additional free spin, and the second one - plus one to the multiplier (up to x5 max). The second bonus is called the Trail o Fortune (because the proper “of” would have been too long). It is activated by three or more pots of gold anywhere on the reels. It works like this: you spin a little wheel, and advance along the trail, increasing your bet multiplier as you do so. The number of these spins depends on the number of pots that activated the bonus. There are shortcuts that allow you to jump ahead several cells, and you can also find a green gem, that gives you an additional spin. At the end of the trail the 1000x bet multiplier awaits. Lucky Leprechaun can’t boast the cutting-edge graphics. Instead, it wins you over with a couple of bonus features and a cheerful Irish theme. Click here to play Lucky Leprechaun - find where the rainbow starts, and all the gold is yours.